Tea Parties and Massacres: Farewell, Boston! Thanks for the times. Farewell, Boston! Thanks for the times. Goodbye, Merlin and Charlemagne. Goodbye, daily dog walks. It's been swell, New England. I love your history and your cemeteries, your snows and your brews, your cobblestone streets and your way too expensive, yet undeniably awesome, historic houses. Call me sometime. On our drive back we stayed in Philadelphia, one of Michael's favorite cities. There we walked through Franklin Court, where we viewed the structure of Benjamin Franklin's house, the Franklin Print Shop, and Franklin's privy pit (below), which is a nice name for an outdoor crapper. After an unsuccesssful attempt to view the Liberty Bell, we decided to conduct a taste test to see who really has the best Philly Cheesesteak. 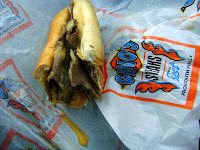 The two rivals, Geno's and Pat's both claim to have invented the cheesesteak. Pat's has a historical marker. They are right across the street from each other, and you order at a window outside. We got both steaks with Cheese Whiz, and each had their good points. 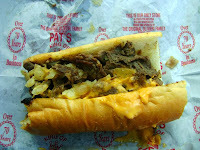 I went back and forth a few times, but after they were both sitting in our stomachs, we agreed that Pat's is the winner. After leaving Philly, we drove to Point Pleasant, WV, to stay the night. Why stay in West Virginia, you ask? Duh, because it is the site of the Mothman sightings. Point Pleasant, a very small and creepy town right on the Ohio River, has a bizarre history. In the 1960s, a moth-like man was spotted flying all over the town, along with other strange occurences like UFOs and men in black encounters, right before the collapse of the Silver Bridge that killed 46 people. You've probably seen that Richard Gere movie. We stayed at the historic Lowe Hotel, built in 1901. Right across the street, is a monument of the mothman. The hotel is the coolest one I've ever stayed in. It's huge! And supposedly haunted. There were hardly any guests. They have a grand ballroom, an old-timey elevator, and one little man at the desk who watches TV in the back and locks the door to the hotel after midnight. Something right out of a horror movie. The next day, we walked through the town, and alongside the river, where they have a mural in the works that stretches across the floodwall and seems endless. It depicts the Battle of Point Pleasant (1774), which is technically the first battle of the Revolutionary War, though some don't acknowledge it. Before we headed out from Pt. Pleasant, we went into the Mothman museum (which is strange that they have one) where we watched a video about the incidents and saw movie props from The Mothman Prophecies, like the police outfit Laury Linney wore and similar boring things. Then we struck a pose (below), and said, "See ya, Mothman, we are outta here!"